Mogadishu, 17 Jan, 2015 (Qalin) – Somalia Prime Minister Omar Abdirashid Sharmaarke dissolved his sixty cabinet members that existed only five days after the the parliament shown its rejection to the members in the list. 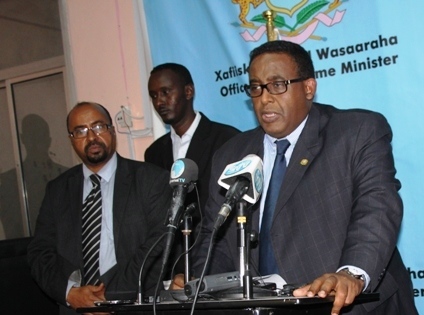 PM Sharmaarke had an emergency meeting with the president Hassan Sheikh Mohamud, the speaker of the Parliament Mohamed Osman Jawari, his deputies and other important figures and submitted a letter recalling the cabinet he announced a week ago and requested the leaders of the parliament to give him 14 days to announce another list. The parliament was expected to vote for the announced cabinet list this Saturday morning, but there was wide rejection from the members of the house which forced the PM to recall his cabinet and dissolve it. According to sources in the PM’s office, Sharmaarke wrote in his internal memo that he recalled the list after he recognized that the parliament would reject the list because of some figures in the cabinet and decided to make review in consult with the president and the speaker of the parliament. Lawmaker Bishar Ugas told VOA Somali service that he got a copy of the PM’s letter of cabinet dissolving, in which the PM requested 14 days period to propose another list of cabinet that can get approval from the parliament. The Parliament opposes three of the president’s ally ministers, who are in the cabinet but more powerful than their portfolios, and paved the way of sacking Premiers for two times. This is the first time in the history of Somalia that a PM decided to dissolve his cabinet even before the parliament voted for it. The PM is expected to hold a Press conference and explain why he decided to dissolve the cabinet list and what changes he wants to make.